Militants conducted 14 attacks at Ukrainian Armed Forces’ positions along the entire contact line yesterday. Ukrainian troops mostly returned fire. 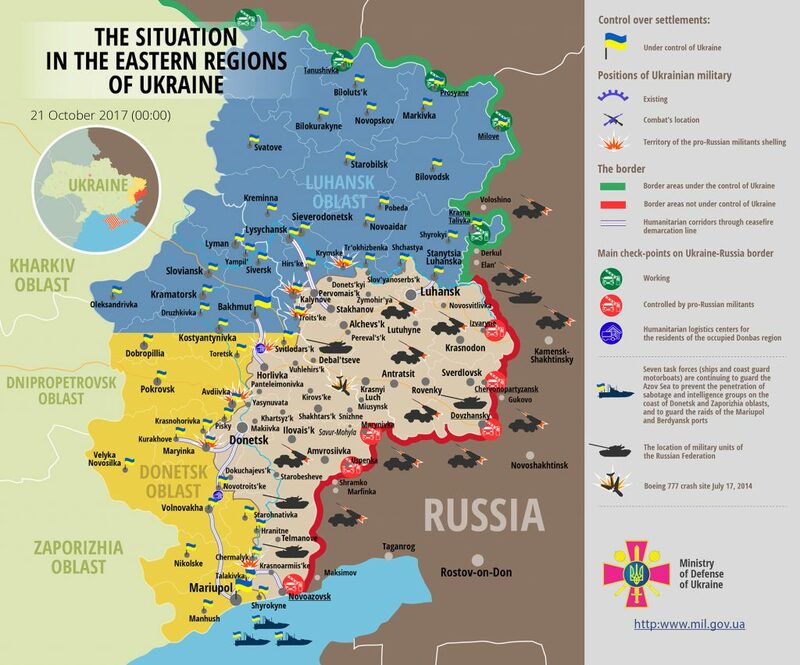 No Ukrainian serviceman was killed in action, but one soldier was wounded and taken to military medical clinic center, informed Ukrainian Ministry of Defense spokesman on ATO-related issues Colonel Oleksandr Motuzyanyk at a press briefing at Ukraine Crisis Media Center. In Luhansk sector militants conducted disturbing fire from grenade launchers and small arms at Ukrainian strongholds near Novozvanivka, Krymske and Novooleksandrivka. “Russia-backed militants fired 35 82-mm mortar rounds at Ukrainian troops’ positions near Troitske,” said Col. Motuzyanyk. Ukrainian troops responded with fire from large machine gun once. In Donetsk sector militants conducted four attacks at Ukrainian positions near Shakhta Butovka, Avdiivka, Kamianka and Verkhniotoretske. “They used grenade launchers and small arms. Ukrainian troops responded with fire each time, using weapons not prohibited by Minsk agreements,” said the spokesman. In Mariupol sector Russian proxies conducted five aimed attacks at Ukrainian positions near Starohnativka, Bohdanivka, Maryinka and Talakivka. They fired with grenade launchers and small arms. “Ukrainian troops responded with fire to all hostile attacks using grenade launchers, large machine guns and light infantry weapons,” emphasized Col. Motuzyanyk. According to the Chief Intelligence Directorate of Ukrainian Ministry of Defense, inhabitants of temporarily occupied territories of Donetsk and Luhansk are frustrated with pro-Russian militants’ action, and pro-Ukrainian sentiments are growing among them. “Owing to this, the enemy increased the number of drills of keeping so-called units on alert with obligatory practice of such elements as “Defeating attack of infiltration teams supported by local population at military camp” and “Organizing all-round defense,” said the spokesman. Report on the military developments as of October 21 is available here. Interactive data on the shelling: chronology shelling chart and the interactive map.